Shall I Enter the Nebraska Republican Primary for U.S. Senate? The tax bill was signed by President Trump on Friday and is now law. In spite of many good individual features, including the reduction of the corporate tax rate from 35% to 21%, it has the overall negative effect of adding $1 trillion to the national debt over the next decade, and this is after allowing for new growth. Every Republican Senator voted for this new law. That means every single one of them is responsible for increasing our debt by $1 trillion. This includes Nebraska Senator Deb Fischer, who is up for reelection in 2018. She needs to be chastised for voting for this atrocious law. Debt. Now worse than ever with the new tax law, we will soon be back to trillion dollar annual deficits. The only real solution is to curtail the growth (no actual cuts needed!) of entitlement spending. Otherwise a new fiscal crisis will soon occur. Global Warming. The evidence for man-made global warming is overwhelming, including warmer and more acidic oceans, shrinking artic sea ice, and rising sea levels. The best solution is to impose a (refundable!) carbon tax to replace all sorts of ad hoc and arbitrary regulations. Economic growth. The U.S. is the most prosperous large country in the world and prosperity equates to economic growth. But our economy is now growing at a 3% annual clip and the new tax law is likely to overheat it and cause inflation to take off. This will force interest rates up prematurely. Trade Policy. Withdrawing from NAFTA would be a disaster for the whole country and especially Nebraska with its export based ag economy. It is China’s mercantilist policies, restricting imports from other countries, which need to be opposed. Immigration Reform. With a national unemployment rate of 4.1% (2.7% in Nebraska), a severe labor shortage is developing. The solution is to establish an adequate guest worker visa program so that employers can be assured of having the employees they need. Conclusion. Senator Deb Fischer is simply unwilling to make the tough decisions necessary to shrink annual deficits and thereby control our burgeoning debt. I would be a sensible replacement for her. Will you support me if I run? Let me know at jackheidel@yahoo.com. Human civilization has made remarkable progress in the past two hundred years starting with the Industrial Revolution. This has been well documented in two current books, The Rational Optimist by Matt Ridley and Progress: ten reasons to look forward to the future by Johan Norberg. But for human progress to continue indefinitely into the future depends on sufficient economic growth. Faster growth means more progress. The purpose of the Republican tax plan now working its way through Congress is to speed up economic growth in the U.S. Global warming is a very serious problem, for which the evidence is overwhelming. The use of renewable energy sources like wind and solar is growing but not fast enough to stop the world wide increase in carbon emissions. It will require the world’s two largest economies, the U.S. and China, working together to solve this huge problem but it can be done. World population is likely to stabilize at about 9.2 billion (the Rational Optimist, page 206) by 2075 and then start to decline. This is because in country after country economic progress has led first to slower mortality rates and then to slower birth rates. When this demographic process eventually reaches Africa, world population will begin to decline. 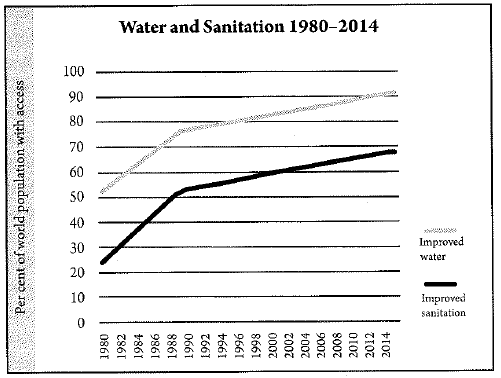 Pollution is on the decline around the world (see above chart from Norberg). Air pollution is declining in the U.S. (see Ridley, page 279) and China is beginning to get serious about it. Natural resources are simply not running out, see here and here. Conclusion. Yes, the world has environmental problems (mainly global warming) but no, they need not stand in the way of economic growth indefinitely into the future. Don’t Get Rid of the Debt Ceiling! Congress has just voted to postpone the debt ceiling by three months until December 8. That’s okay; it’s just a tactic which also provides quick federal help for the damage caused by Hurricane Harvey. 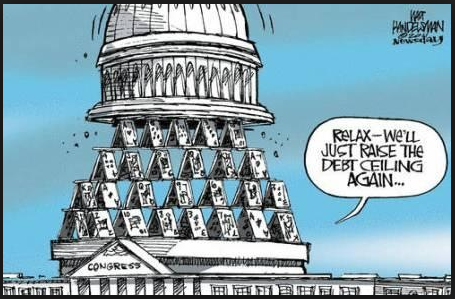 The important thing is not to repeal the debt ceiling entirely. As I have said before, global warming and national debt are both creeping catastrophes. We ignore them at our great peril. Right now hurricanes Harvey and Irma are reminding us of the huge devastation which can be caused by extreme weather events (which are made more likely by global warming). In the same way, having an explicit debt ceiling reminds us at regular intervals that we have a very serious problem which will eventually catch up with us if we don’t take strong action to address it. I know that I’m repeating myself but I can’t help it! The National Debt, now 77% of GDP (for the public part on which we pay interest), is the highest it has been since right after WWII. 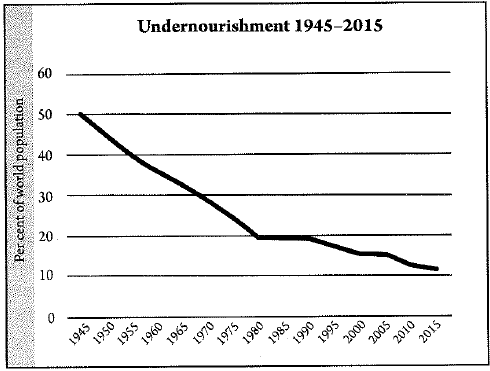 It is predicted by the non-partisan Congressional Budget Office that it will keep getting steadily worse without major changes in current policy. The urgency of the debt problem is based on the fact that interest rates are now so low that our debt is almost “free” money. But interest rates will inevitably return to more normal, and higher, historical levels and, when this happens, interest payments on the debt will increase dramatically. This will eventually lead to a new Fiscal Crisis, much worse than the Financial Crisis of 2008. The solution to this problem need not be drastic. Federal spending is growing by 5% per year while tax revenues are increasing by 3% per year. All we need to do, so to speak (because it will take some restraint! ), is to hold spending increases to about 2.5% per year and then the federal budget would be balanced in a few years and debt would start shrinking as a percentage of GDP. Conclusion. Congress, the President and the American people need to be reminded often and loudly how serious the debt problem is. Hopefully the message will eventually sink in. The sooner the better! How Should We Respond to Global Warming? In my last post I summarized the scientific evidence which convinces me that global warming is occurring and is primarily caused by the emission of carbon dioxide from the use of fossil fuels for energy production. Several Face Book comments on my post suggest that there could be other causes such as a decrease in cloud cover over the earth, sunspot activity and even the carbon dioxide which is exhaled by the 7 billion (and growing number of) humans now alive on earth. I am personally unable to evaluate the validity of these possible causes. I rely on the overwhelming consensus of climate experts that the problem is caused by the burning of fossil fuels. Perhaps the scariest evidence is the warming of the oceans and the related rising of sea levels by 1/8 of an inch per year (which is equivalent to a one foot rise per century). When I referred to the three recent catastrophic hurricanes of Katrina (2005), Sandy (2012) and now Harvey, several readers responded that there is no proof that the severity of these storms was caused by global warming. I agree! It is just that warmer oceans mean more evaporation and therefore more rainfall around the world. This means that severe storms will become more likely as the oceans become warmer. 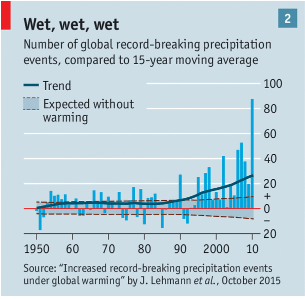 Take a look at the two charts from the current issue of The Economist. They show that various types of natural disasters have been increasing in recent years and that record-breaking precipitation events are on the increase. Conclusion. Global warming is already happening. But we can act to keep it from getting worse. More renewable energy (wind and solar) is only part of the answer. The best way to cut back on carbon emissions is with a (revenue neutral) carbon tax. This would be much more efficient than ad hoc regulations like the Clean Power Plan and ever higher auto gas mileage standards. Global warming is a controversial issue and I would like to take as dispassionate a look at it as I possibly can. First, I will summarize what I consider to be the main evidence for global warming and then discuss what this means for public policy. Greenhouse gasses (mostly carbon dioxide) in the atmosphere have been increasing since the beginning of the industrial revolution and have now reached approximately 400 parts per million. Ocean heat content has been building steadily in recent years. Warmer water means more evaporation into the atmosphere which means more precipitation around the world. The extent of summer sea ice in the Arctic has gradually been receding. A big chunk of sea ice (the size of Delaware) has just broken off the Antarctic Peninsula and is floating in the South Atlantic Ocean. The sea level is rising at the rate of one-eighth of an inch per year which is equivalent to one foot per century. Globally, eight of the world’s ten largest cities are near a coast. In the U.S. Spring is arriving earlier each year on average, especially in the Southeast. Some of these phenomena may be beneficial such as more rainfall around the world and longer growing seasons. Less ice in the Arctic Ocean allows more summer navigation. But rising sea levels will become catastrophic in low-lying coastal areas. Conclusion. The above observational evidence for global warming is well established and hopefully non-controversial. The sources are scientific agencies whose integrity should be beyond reproach. Once we accept the fact that global warming is for real and is caused by human activity, the question is what we should do about it. This will be the topic of my next post. Three devastating hurricanes have struck the U.S. in recent years: Katrina (2005), Sandy (2012) and now Harvey (2017). Hurricanes and tropical storms are natural events which have occurred since the distant past, long before global warming became a problem. 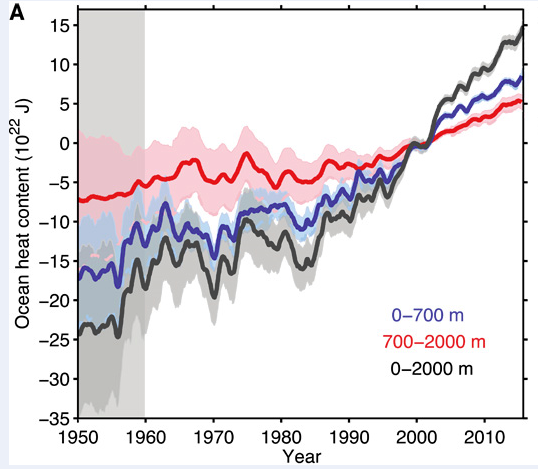 What has changed is that the oceans are now steadily getting warmer by absorbing much of the heat reflected back to earth by greenhouse gases (see chart). Warmer water has more latent energy and this makes hurricanes more severe. The warmer the oceans become, the more devastating future hurricanes will be. It is (past) time to get serious about global warming. As the world’s strongest country, it is up to the U.S. to provide leadership on this very serious problem. The best way we can respond is by adopting a (revenue neutral) carbon tax to discourage future carbon emissions as much as possible. This problem is not going to disappear but it is within our power to limit the damage it causes before it gets a lot worse. The exact same thing is true about our national debt. 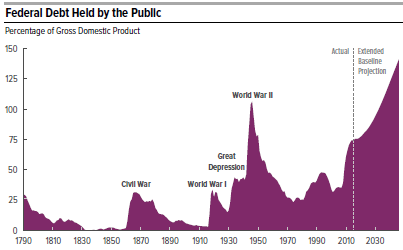 At 77% of GDP (for the public part on which we pay interest), it is the highest it has been since the end of WWII. Right now interest rates are so low that our debt is almost “free money.” But interest rates will eventually return to more historically normal levels. When this happens, interest payments on the debt will rise by hundreds of billions of dollars per year. At that point a severe Fiscal Crisis will not be far behind. Again, debt is a solvable problem if only our national leaders will take it seriously. All it requires (so to speak, because it won’t be easy!) is to limit future federal spending in sensible ways. Conclusion. Both global warming and national debt are serious, urgent problems. The sooner we get started on addressing them, the better off we will be. As I frequently remind my readers I am a fiscal conservative and a social moderate. I usually write about particular economic and fiscal problems facing our country. But every now and then I like to step back and view our overall situation at one time. The last time I did this was here. The economy is puttering along at 2% annual growth with a relatively low unemployment rate of 4.3% and a good indication that faster growth, up to 2.5% annually, is right around the corner, see here and here. The economy, at least, is headed in the right direction. Foreign policy. Long term our biggest problem is China, which has four times as many people as we do and is growing economically three times as fast. China will soon surpass us in both economic and military strength. Our best insurance for this inevitable day is to have lots of democratic friends around the world. Global warming is real and getting worse. Our best strategy for dealing with it is a revenue neutral carbon tax, rather than depending on ad hoc regulations like the Clean Power Plan and ever increasing auto emission standards. If the U.S. demonstrates its seriousness with a carbon tax, it is likely that the U.S. and China (which is highly polluted) could work together to establish world-wide carbon emission standards. National debt, currently 77% of GDP (for the public debt on which we pay interest), is predicted by the CBO to keep getting steadily worse (see chart) without major changes in current policy. Right now our approximately $14.3 trillion public debt is almost “free” money because interest rates are so low. But sooner or later interest rates will return to more normal levels and, when this happens, interest payments on the debt will rise by hundreds of billions of dollars per year. This will inevitably lead to a severe fiscal crisis, far worse than the Financial Crisis of 2008. Conclusion. I am relatively optimistic that we can maintain good relations with China and will have the good sense to better control carbon emissions. But our debt problem is politically very difficult to address because it will require spending curtailments. How do we successfully address such a huge problem?